Labor Day—what is it? Perhaps not many Americans any longer know, so here is my explanation. In my time Labor Day was the unofficial end of summer, because school began after Labor Day. Today school begins almost a month before. When I was in school that would not have been possible, especially in the South. The schools were not air-conditioned. If school had started in August no one would have showed up. It was difficult enough getting through May before school was out in June. As most Americans probably thought of Labor Day as the last summer holiday, now that Labor Day has lost that role, what is Labor Day? The holiday originated as an apology capitalists tossed to labor to defuse a standoff. Workers understood that labor was the backbone of the economy, not Wall Street moguls or bankers in their fine offices. Workers wanted a holiday that recognized labor, thus elevating labor in public policy to a standing with capital. 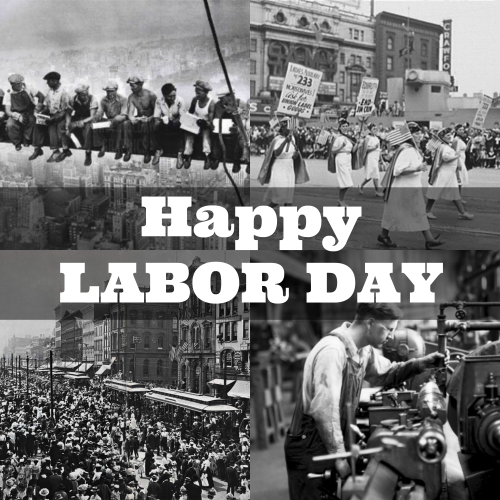 Some states created labor day holidays, but it wasn’t until 1894 that Labor Day was made a federal holiday. Congress created the federal holiday in response to the murder of strikers by US Army troops and federal marshalls during the Pullman strike of 1894. The factory workers who built Pullman railway cars lived in the company town of Pullman. George Pullman provoked a strike by lowering wages but not the rents charged in the company town. President Grover Cleveland relied on Attorney General Richard Olney to restore capitalist control. Olney, a former railway attorney, sent in the federal violance to break up the strike. Olney still received a retainer from his railway company that was larger than his salary as US Attorney General. So we know whose side he was on. The presstitute media portrayed the beaten down strikers as unpatriotic foreigners, and the strike leader, Eugene Debs, was sentenced to federal prison. The experience radicalized Debs and turned him into a socialist. The obvious injustice created more sympathy for labor than capitalists could stomach, so Congress defused the situation by creating Labor Day. President Cleveland washed his hands of the blood on them by signing the legislation. Officially what we are celebrating on the first Monday of September is American labor, but what is really being celebrated is the success of capitalist pigs again flummoxing the people and avoiding a real social revolution. The labor movement, which gave us Labor Day, is no longer with us. The American labor movement died about ten years after the death of its most famous leader, George Meany of the AFL-CIO. Meany, born in 1894, died in 1980. I remember when labor was at the center of politics and policy. There was even a field of economics called “labor economics.” The political influence of labor ended with the offshoring of US industrial and manufacturing jobs. For years US capitalists tried to avoid a fair shake for labor by locating their facilities in Southern states that had right to work laws. But with the collapse of the Soviet Union and the change in attitude of India and China toward foreign capital, capitalists learned that they could increase profits by using foreign labor offshore to produce the goods and services that they sold to Americans. The difference in labor costs flowed directly into profits, executive bonuses, and shareholder capital gains. Free market economists, who live in a make-believe world, pretend that the lower labor costs flow into lower US consumer prices and that consumers beneift despite the loss of well-paying jobs. The problem with free market economics is that a priori reasoning takes precedence over empirical fact. For free market economists, the way the world should be prevails over the way that the world actually is. As a consequence of jobs offshoring, industrial and manufacturing cities became semi-ghost towns with decling populations. Municipal and state governments, deprived of tax base, found themselves under duress to make pension payments. To avoid immediate bankruptcy, cities such as Chicago sold off public assets such as 75 years of parking meter revenues for a one time payment. The Democratic Party, which had been the countervailing power against the Republican business party, was deprived of union funding as the jobs that paid union dues were no longer in America. By moving production offshore, capitalists turned the Democrats into a second capitalist political party dependent on funding from the business sector. Today we have one party with two heads. The competition between the parties is about which party gets to be the whore for the capitalists for the next political term. As Democrats and Republicans swap the whore function back and forth, neither party has an incentive to do anything different. The offshoring of high productivity, high value-added US jobs has destroyed the labor movement. How much luck will labor leaders have organizing people who hold part-time jobs as waitresses, bartenders, hospital orderlies, and retail clerks? As I have pointed out for years in my reports on the monthly payroll jobs reports, the United States now has the labor profile of a Third World country. The absence of jobs that can support an independent existence and family life is the reason that more Americans aged 24-34 live at home with parents than live independently. The absence of jobs is the reason the labor force participation rate has declined for years. The absence of jobs that pay sufficiently to provide discretionary income is the reason the economy cannot grow. Looking at last Friday’s BLS payroll report, the jobs are in the lowly paid, part-time service sector. The goods producing sector of the economy lost 24,000 jobs. The jobs are in retail trade, health care and social assistance, waitresses and bartenders, and government, a tax supported operation. Whether Washington policymakers realize it or not, the American work force smells like India’s of a half centruy ago. Whatever deranged Hillary and her neoconservatives claim, there is no evidence in the compositon of the US labor force that the US is a superpower. Indeed, what the employment statistics show is that the United States is a third world country, a country whose leaders are so out of their minds that they are picking fights with first world countries—Russia and China. The United States of America is on its last legs. As there is no willingness to recognize this, nothing can be done about it. America’s last function is to cause World War 3 in which all of us will expire.